The Social Life of Small Urban Spaces opened my eyes years ago to what makes outdoor spaces successful. It felt like the rosetta stone for creating great public space. Like many urban designers, the genius of William Whyte’s insights inspired me to create spaces that imbued these revelations. Choice in particular resonated with me. Choice meant freedom to allow the user to change the public space to adapt to their needs and the situation. Movable tables and chairs were the epitome of this. Over the years, I became frustrated with how difficult it is to use movable tables and chairs in the landscape. Fixed seating is the de facto choice for many public spaces despite its inflexibility. 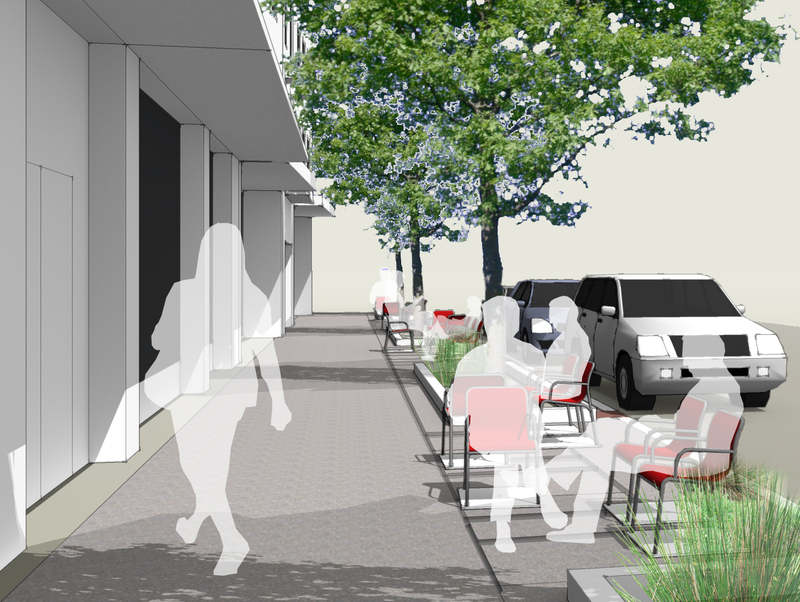 Unfortunately, movable seating’s inherent Achilles’ heel, mobility, limits its use in the public realm. Property owners and managers are often concerned the tables and/or chairs will be stolen or used to vandalize the property. 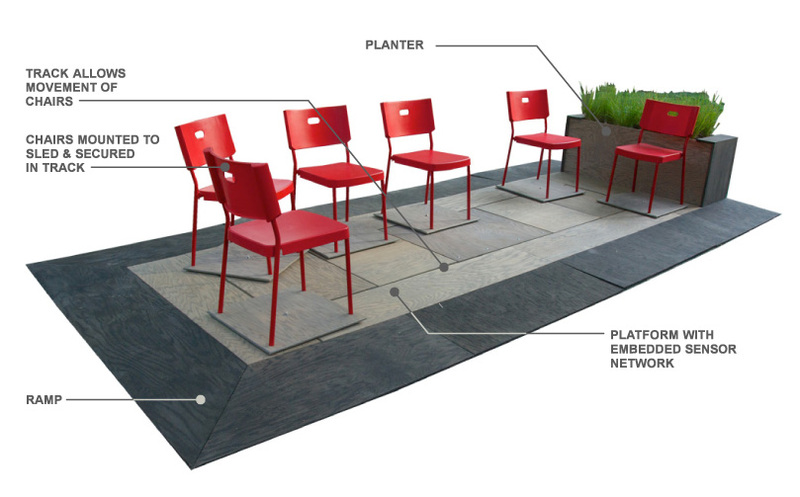 In desperation, designers are left with the choice of using immobile seating arrangements or other undesirable arrangements such as fixing table to the pavement and cabling the chairs to its center. In cases where property owners are willing to courageously take their chances with movable seating, their deployment typically is closely managed. This requires vigilance and manpower to ensure the seating will not be taken. Examples include having on-site security, implementing RFID tagging, and/or deploying them only during business hours. These solutions can be overbearing, costly and inconvenient. Our first project, CHAIR>bench addresses this problem by creating a securable, scalable, and flexible platform that can accept nearly any table, chair, or other site furniture element that would benefit from being mobile. The track and sled system technology (patent pending) demonstrated by the project facilitates a wider use of movable site furniture in the landscape. The attached site furniture can be moved anywhere on the track and be rotated 360 degrees on the sled’s central axis. The system can be deployed at any scale and configuration. The alignment of the track can also take on practically any desirable shape. Freestanding Platform. Like the CHAIR>bench project, the platform can be constructed using a durable material (i.e. stainless steel) with the tracks slotted into it. The platform can be secured to the ground while still allowing the freedom of movement of the site furniture welded to the sled. The size and configuration of the platform and/or the track can be of any size and shape. 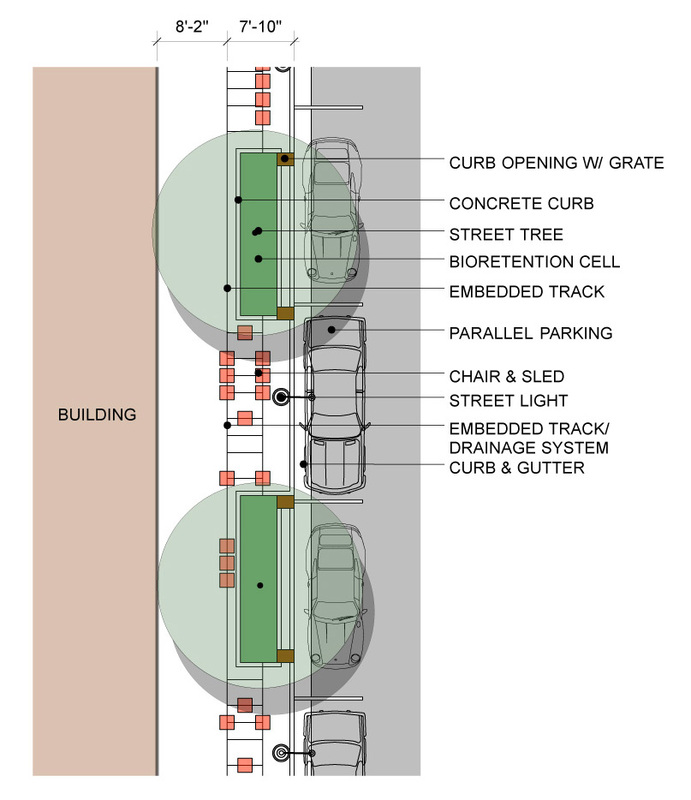 The system could also be integrated into a custom parklet where the mobility and security is desired. Permanent Embedded Track In Pavement. In addition to a freestanding platform utilizing a track made from stainless steel or other non-corrosive material, the technology can be permanently embedded horizontally in the pavement to allow tables and chairs attached to the sled to be secured and movable. By embedding or mounting the track into or on the face of a vertical surface such as amphitheater seating or a seat wall, a table can be secured to allow it to be moved easily into position or out of the way. In addition, the track can utilize curbs or other features to allow for tables and chairs to be moved along the track and have a 180 degree movement. In all embodiments, the site furniture can be changed out or removed easily as the needs of the space change. The CHAIR>bench project further engages the public and demonstrates the future of smart spaces through the use of an network of sensors embedded within it. The network provides real-time feedback of how much the space is used and the movement of the chairs. This system can provide helpful metrics to designers and managers of permanent public spaces and/or tactical urbanism environments for determining the success of spaces. In addition, this data can be used to control the environment around the user and provide a means for responding to the users. The project will play selected audio clips when the chairs are arranged in specific positions. Information and instructions regarding these arrangements can be found in the “How to Use It” section of this site. This entry was posted in CHAIR>bench and tagged CHAIR>bench, inspriration, Movable Chair. Bookmark the permalink.